Kerry Says Strikes By Russia, Syria 'Beg For' A War Crimes Investigation : The Two-Way "This is a targeted strategy to terrorize civilians and to kill anybody and everybody who is in the way of their military objectives," U.S. Secretary of State John Kerry said. U.S. Secretary of State John Kerry speaking in Brussels earlier this week. 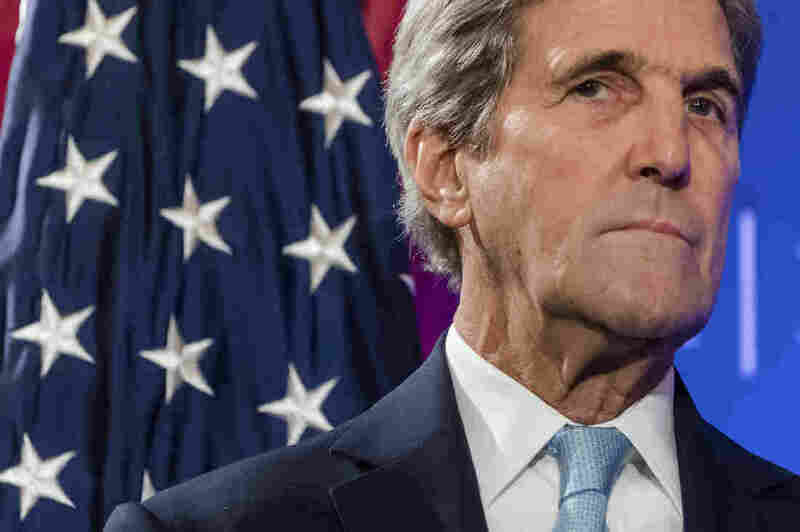 U.S. Secretary of State John Kerry is ratcheting up his rhetoric against Russia and Syria. "Russia and the regime owe the world more than an explanation about why they keep hitting hospitals and medical facilities and children and women," he said in remarks Friday ahead of a meeting with France's foreign minister. "These are acts that beg for an appropriate investigation of war crimes." The U.S and Russia back different parties to Syria's conflict — Russia is aligned with the regime of Syrian President Bashar Assad, while the U.S. supports rebels fighting government forces. "They're beyond the accidental now — way beyond. Years beyond the accidental. This is a targeted strategy to terrorize civilians and to kill anybody and everybody who is in the way of their military objectives." A new report from Doctors Without Borders highlighted the desperate situation that medical facilities face in the divided Syrian city of Aleppo. The group says there have been "at least 23 recorded attacks on eastern Aleppo's eight remaining hospitals since the siege began in July." The eight hospitals in rebel-held eastern Aleppo are overwhelmed, with patients "literally dying on the floors of the facilities." Doctors Without Borders, also known as Médecins Sans Frontières, added that "in an area with a population of approximately 250,000, only seven professionals remain who are capable of performing surgeries on war-wounded patients." Talks between Russia and the U.S. collapsed last week. The two sides had agreed to a weeklong cease-fire where aid was to be distributed to besieged areas — if the truce held, the idea was to coordinate airstrikes against the Islamic State and a rebel group formerly aligned with al-Qaida. But the airstrikes resumed and the U.S. pulled out of talks, saying that Russia had "failed to live up to its commitment," as NPR's Michele Kelemen reported. In a separate development Friday, "Russia's lower house of Parliament ratified a new treaty with Syria that would allow Russia's military to remain indefinitely in the Arab country," as The Associated Press reported. The news service added that "the vote was unanimous, a show of support for Syrian President Bashar Assad's government."